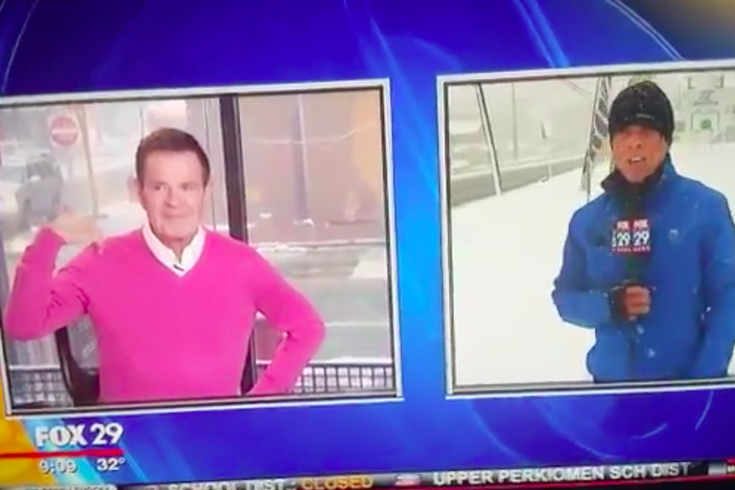 During the Philadelphia region's first major snowstorm of the year Thursday, FOX29 reporter Steve Keeley managed not to get knocked over by plowed snow (so far), but he was able to make everybody watching "Good Day Philadelphia" cringe. During the broadcast, host Mike Jerrick, who was recently suspended for saying White House senior adviser Kellyanne Conway is good at "bulls---," wore a pink sweater, which became a topic of conversation on the show and on social media. As CrossingBroad first pointed out, Keeley tried to play a joke on Jerrick about the sweater, asking him to "model" it by posing in a way that appears to portray a stereotypical depiction of a gay man. Jerrick, realizing what Keeley was seemingly asking him to do, quickly tried to get out of the situation. An email has been sent to FOX29 seeking comment, and this article will be updated accordingly.